I enjoy typecasting partially because not everything is evident to search engines. However, there are also occasions where I intentionally throw in search terms. We'll just say I am subject to fits of whimsy. I do not opt to link Google+ to my blogs because of the issues you mentioned. I have mixed feelings myself about typecasts. 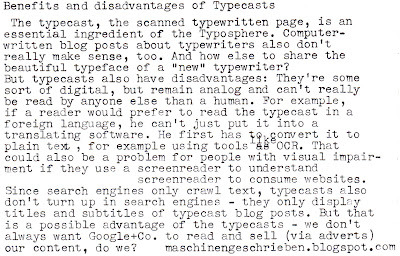 On one side it's always interesting seeing a page produced in a typewriter, because no typewriters type in the same way: some will be worn out, some will have different type styles, others will have the typebars dirty... all these details make typecasts as individual and personal as a hand-written page. On the other side, I do like the fact that my blog can be read by people from all over the world, either in the original language (Spanish), or, via the automatic translator offered by Google, a sufficiently accurate version in a foreign language to make the context understandable. Good points. Almost anything on line will eventually be known to the world. So far only blogs can be found and not the typecast. It would be nice if the typecast could be autotranslated like the blog. @Richard: That's a good point. Sooner or later, that will possibly happen, in the name of "better search results". @Dwayne, thanks for writing comment Nr. 500! I handle it similiarly, when I believe a post could attract some search engine traffic, I usually OCR the typecast and hide it with font size 0% and written in white at the bottom of the post. 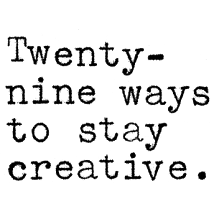 @Miguel, I think typecast are important to "capture" the "soul" of the typewriter and its typeface. But as you mentioned, I'm glad I can use Google Translator to read your posts. 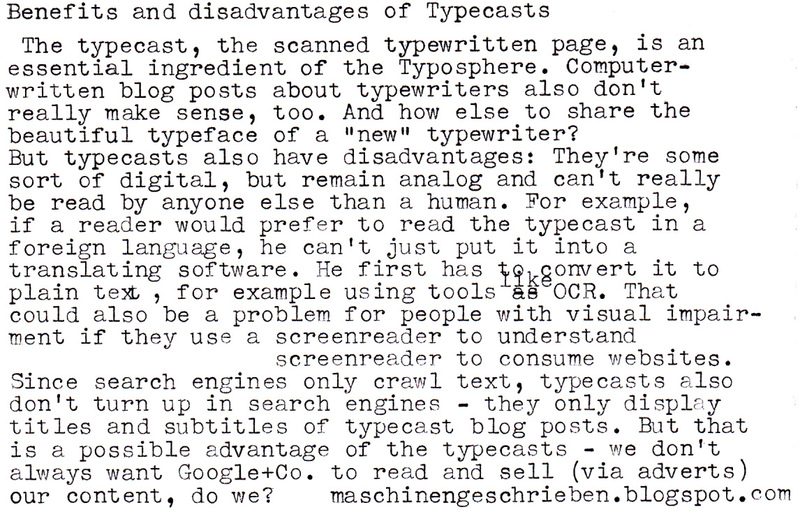 In the early days of maschinengeschrieben, when I used to write in German, I OCR'd the typecasts and added Google Translations below, but that's quite an extra portion of work. These are all good points that I hadn't considered. I tend to see type- and pencasting as alternatives to current technology, but as you point out, they are still quite tech-dependent. I'm embarrassed to admit that I hadn't even considered the language issue with typecasting. Maybe it's because I grew up on Star Trek, and the universal translator was always working!